Regional Information Center "CARPATHIANS" » DACITE DYKE. 48° 33′ 27″ N lat; 22° 56′ 26″ E long. In the wall of closed quarry located on the right bank of Latorytsya River, close to the road, with main bench length more than 200 m and up to 15 m height there is exposed flat-laying Neogene (absolute age about 13.3 Ma) dacite dyke which cuts Paleogene terrigenous sediments. 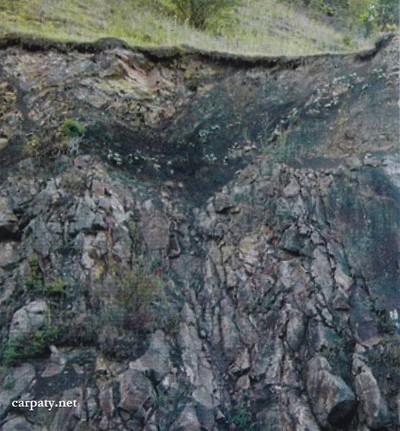 Emplacement of the sub-intrusive rocks (red on weathered crust) into the dark-grey marine sediments occurred at the early sub-volcanic stage of Neogene tectonic-magmatic activization in the zone of Trans-Carpathian deep-seated fault. Intrusive (“hot”) contact of the dyke with sediments is excellently exposed and accessible for observation. Accessible by motor-car. 3 km to north-east from the Suskovo village centre by the road Mukachevo – Svalyava. « KVASIVSKE OUTCROP OF SECONDARY QUARTZITE.